The Halloween Spooktacular session concluded in a showdown between Cobalt, illusioned as a male Nightmare Moon, with Luna. Having been flung directly into Luna's backside by a hypnotized, or perhaps hallucinating, buff pony, Harley Wisp, the otherworldly pony now effectively strapped to Brynn via an enchanted mask, made Cobalt appear as the infamous traitor. After a brief chase and the spell wearing off, all was explained to Luna. Well, all about the "costume" you had that was so convincing. 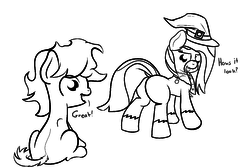 For now, Harley is still unknown to anypony other than yourself and Brynn, your partner in the paranormal. But that was a few weeks ago. The weather has continued it's fall-ward shift. Leaves changed from lush green to fierce orange and reserved browns as they fall from trees rapidly cleansing their limbs for winter. Ponyville seems more subdued during this time, more ponies choosing to stay indoors in the warmth of their homes than head outside and face the briskly cool winds. Not all ponies are like that though, as you and the CMC prove now, a laughing, giggling line of ponies with their school bags, free from the hum drum indoors of school. The four of you skid to a halt once you're off school grounds, kicking up piles of leaves as you play before Apple Bloom waves you in to form a circle. "Alright," she begins, moving the end of her seasonal scarf back behind her neck, so as not to cover her mouth, "What'd you all want to do on our extended weekend? I was thinkin' maybe I could get Applejack to let you all come over for a sleepover. With hot cider an-"
"A sleepover!" Sweetie Belle exclaims, hopping in the air gently with a smile, "That sounds great! We can play all kinds of board games, or tag, and drink cocoa, and wrap up in nice warm blankets…"
Sweetie begins to hop in a circle around the rest of the group, rattling on various activities. Some of which aren't party games so much as just things to do, but she doesn't seem to mind. "Are you going to tell her Cobalt's coming too?" Scootaloo asks, "I don't know if she'd be too keen on having a colt over…"
Apple Bloom scoffs, waving a hoof dismissively, "Ain't nothin'! She's met Cobalt already and they got along well enough. Besides, if it's really a problem, he'll just have to sleep in a separate room or something." "I guess…" Scootaloo says after thinking it over a moment. "No sense getting worried about it yet anyway. We still gotta go ask her!" "But what does Cobalt think?" Sweetie suddenly asks, stopping and pressing in between you and Apple Bloom and looking sideways at you questioningly. That is your cue. Unless I have been fooled, in which case I'm leaving this here anyway. "You bet it does!" you reply enthusiastically, earning smiles from everyone. Suddenly, a thought crosses your mind. "Hey, uh, would it be alright if I brought someone along?" The three raise their eyebrows and give each other a look, before Sweetie Belle gasps. "Of course he meant Brynn," Scootaloo says, rolling her eyes and nudging Sweetie out from between you and Apple Bloom. Sweetie yelps a bit as Scootloo takes her place, though Scoots seems to be leaning on you quite a bit…. "Who did you think he meant? Diamond Tiara? Silver Spoon? Maybe that quiet one….the pink one with braces….whatever her name is." "I think it's Dune," Sweetie says uncertainly, raising a hoof to her chin and plopping unceremoniously onto her rear as she thinks. She moves her scarf as an afterthought. "Well, who did you mean, Cobalt?" Apple Bloom asks, moving across from you so she can see you instead of trying to make eye contact with Scootaloo in the way. >Who do you want to invite along with you? Or would you rather drop it? She's awesome, and she's friends with Applejack, so why not? We're playing the part of a colt. We're good friends with the CMC and know some of the mane 6, but would you invite them to a kid's sleepover? Besides, it WOULD be pretty cool. "Or was it Dusk?" Sweetie says, continuing to not know the poor ponies name. "Well, who did you have in mind?" Apple Bloom asks again as Scootaloo puts a hoof around your shoulders. "Yeah, who? Or is it fine with just the four of us?" "Scootaloo has a point," Apple Bloom says, halting what you were about to say, "There's only so much room in the club house. It isn't too small for say, six small ponies like us. But if we all gotta sleep in there we might be…touching, a bit." You feel your face heat up a little before you shake it off. You'll figure something out. First you gotta figure out who you're bringing, if anyone. >What is your final answer? >we might be…touching, a bit. I'd say invite Brynn, maybe he could loosen up a bit. We should ask Brynn if he WANTS to come along, he might not. He's a rather introverted colt. "Oh don't act like you don't want to just snuggle up with Cobalt," Scootaloo says, squeezing you against her just a little, betraying her supposed confidence. Apple Blooms' complexion reddens a bit before she separates you and Scootaloo by dragging Scootaloo away from you via the scarf the poor orange pegasus wears. "Cobalt, make your mind up while we have a little chat!" I was hoping this wouldn't happen, but I guess it was coming. Yeah I'm fine with asking him. I guess he could help out and he might not even say yes. You might want to ask about that later. Maybe. She seems a little…different than usual. "I'd like to ask Brynn if he wants to come," you say, Sweetie Belle the only one near enough to hear you. Your comment breaks her out of her guessing game and she nods with a smile. "I wouldn't mind. We haven't talked much but he seemed nice." "Sweetie, you think everyone is nice," Apple Bloom replies, returning with a more…withdrawn looking Scootaloo right behind her. She sighs before smiling at you. "Well, I guess I wouldn't mind either. Might be kind of odd for you to be surrounded without any fellow colts to keep you company, right?" You try your best to not give any real response. "I think I saw him back in the classroom when we left," Scootaloo says, "Might still be able to catch him if you hurry." >You might want to ask about that later. Maybe. She seems a little…different than usual. Withdrawn? Sounds like Scoot got a stern talking to. Hehe. Scootaloo owes you a favor, if you wish to redeem it. It may come in handy, so think hard before using it on something frivolous. You thank the three of them before taking off, Sweetie Belle waving after you despite the fact you're not going very far. You round the corner of the fence and make it nearly through the door when a pony steps out of the shadows and into your path! oh crap how do I roll again? I swear if you bring that in here I will end you. I know, I'm just giving you a hard time. You deftly dodge out of the way while still heading into the school, though the pony in question yelps out in surprise. You're already out of the way when Miss Cheerilee backs into the wall in an effort to not hit you, a look of bewilderment plastered on her face. You poke your head into the classroom, now only lit by the rapidly descending afternoon sunlight coming in through some of the windows. "Goodness! Cobalt, you scared me half to death!" Miss Cheerilee says, catching her breath and straightening the papers sticking out of her saddlebag. Hah, wait till the mask gets back on. Ask teacherhorse where Brynn has gone off to. I mean, we ask if she saw Brynn. What's slappin' Cheerilee? Where's Brynn? +1 player. Glad we're not too far in byt he looks of it. Didn't see the /qt/ message until about 3PM Central, and decided sleep was more important. Catching up now. We were just looking for Brynn, do you know where he'd be? If she doesn't know, we should check the library. "Brynn?" Miss Cheerilee asks in response, "Oh, he's out on the swings at the playground. But, Cobalt, before you go talk to him…may I have a word?" You nod, stepping toward Miss Cheerilee who continues to fidget with her papers. Is she nervous? "It's about Brynn," she says when the two of you are standing just outside the schoolhouse door, "Ever since the week after Nightmare Night he's been even more reclusive than ever. I'm sure you noticed." Not particularly. He seems buried in his books just as often as ever. "He's been buried in his books as usual," she says, echoing your thoughts, "But he doesn't go outside to read during recess anymore if you noticed." "And sometimes I swear I see him wearing this…mask, or something, around his neck and muttering to himself. Or maybe to it. I can't tell and I haven't asked since…well…for the first time, I'm not sure how to approach a student with my concerns. I just get this…weird feeling every time I start to head over there." She shivers a bit, closing her eyes as she regains her composure. "Please, Cobalt, if you can talk to Brynn and see if he's alright for me? Make sure he's all squared away? I don't know why I feel so concerned, I've have introverted students before. But…something about this rubs me the wrong way. Could you talk to him for me, please?" Sounds spooky. And Romantic. Spoomantic? Agree to talk to him, but don't let anything on about what we know. Oh jeez. I hope he's not getting TOO into that paranormal stuff. I mean it's cool but if he's going to go mental we've got to help him out. "Thank you, Cobalt. I know he's your friend and he'll tell you if anything is wrong. If it's something serious, please tell me right away so I can help. Okay?" You nod and earn a smile of gratitude from Miss Cheerilee before you head off to the playground. Sure enough, Brynn is on one of the swings. He faces away from you, and he isn't swinging very fast. He's kicking his legs just enough to move back and forth. When you get closer you hear him talking aloud to himself. "Hahaha! No, no way! You did? When?….Is that why she nearly jumped from her desk?…..Haha, oh jeeze, I wish I'd been looking…….Of course I want to see when you do that stuff, it's amazing! And-"
He turns around a bit, falling silent as he hears hoofsteps. You walk to the other side of the swings after greeting him, and sure enough he's wearing the mask around his neck again. "Hello Brynn. Hello Harley," you say warmly. Brynn smiles and you swear the mask does too. You may want to keep that Harley business more private unless you want all of ponyville thinking you're nuts. Hey… dude… are you ok? Cheerilee says you've been acting kinda weird lately, I think she's a little suspicious of the mask. How long are we gonna keep her around, anyway? I mean, Nightmare Night was pretty awesome, but I almost got annihilated by Princess Luna. So… maybe we should think about letting her go again. It's been fun, don't get me wrong, but ponies are going to start thinking you're crazy or something. On Nightmare Night Brynn and Cobalt decided to utilize that book that Brynn acquired from Twilight's Library. Using one of the ritual summoning whatevers in it, Brynn bound Morata Nalan, Trickster Spirit, to the mask. By putting the mask on afterward he then bound her to him. When he puts the mask on he disappears and Morata appears. She desired a new name, and the two of you now call her Harley Wisp, or Harley for short. She can seemingly cause people to hallucinate and make things change appearances, as well as animate inanimate objects. She claimed that her and the one bound to her, Brynn, could speak to each other telepathically as long as they had the mask in their possession, but this has yet to be confirmed in any way other than Brynn's say so. And his apparent talking to masks. I feel she hasn't revealed the full extent of what she can and can't do. I just ran into Cheerilee and she's been noticing you two talking and that you haven't been heading out at recess anymore. She doesn't suspect about Harley, I don't think, but she did seem to be worrying that you're withdrawing a bit too much. Might be best to allay her fears in case she mentions it to others, and someone else starts catching on. Plus I don't like making Miss Cheerilee worry. You give him the talk about why he's talking to himself and keeping the whole matter under wraps. His smile fades slowly over the course of the talk, and soon his looking down at the ground near your feet; Like a child caught doing something he knows he's not supposed to. He sighs when you're finished, taking a moment to think before responding. "I know, Cobalt. I know…But, I don't think you understand. When I'm not wearing the mask, at least around my neck on the string, I feel…like I'm missing something. Like there's a spot in my heart now where the mask, where Harley, belongs. When I'm wearing it I feel….right. And I can talk to Harley when I'm wearing it! I know we can talk without me speaking, but, I feel better when I can use my voice. I know she has a sense for it and can imagine me saying it, but it feels better to actually say it. That's what I've been doing. I know I shouldn't during school but I can't help myself! Did you know she can influence your dreams when you sleep? After Nightmare Night she was in my dream, explaining things, talking to me and recreating the whole event! It was crazy! I…I don't even know how to explain it! But she did it!" Invite him to the sleepover, and ask him to leave Harley somewhere safe at home. Maybe he just needs some time away from her. Just a break, I don't think that's a big deal. "Hey, hey, woah, relax, Brynn, buddy…" you say uneasily, taking some steps toward him with a smile. Maybe it's just the way he's talking, or holding the mask when he talks like that, but you've got a hunch he hasn't taken it off for a while now. Or if he has it's been for very short periods of time. Probably. Right? "Just relax. Anyway, the CMC are having a sleepover and-"
"And they invited you." Brynn finishes, staring down at the smiling mask in his hooves. >Yeah, but I want you to join us. >It was an open invitation to bring friends! They asked if I wanted to bring any friends, and you could use the break anyway. C'mon, we can do more paranormal stuff later. Maybe you can even tell some spooky stories, it'll be fun! "They asked if I wanted to bring anyone and I want you to come. They're all okay with it, Sweetie seems to be looking forward to you coming over to be honest, and I think you could use some time with the gang." "….Sweetie is looking forward to me showing up?" "Yes," you say with a nod, moving closer to him until you're right in front of his now motionless swing, "Just leave the mask, and Harley, at home for a night. Come hang out with us, your friends-"
"Harley is my friend too." "Yes, she's a friend to both of us. But, to be honest, you're weirding me out a little, Brynn. I want you to come spend a night with the rest of us. You can tell me more about Harley after, but you can't bring her to this. Okay?" Gulp. If this is a reaction roll, I don't know if I like that +3 at all…. Brynn looks at you, then at the mask. Eventually, he sighs, and takes the mask off from around his neck. "She agreed, and….I think you're right." Reluctantly, he hands the mask to you. "The only way I can guarantee that I won't put it back on soon is if you take it. Just for now, mind you. I…I want her back, sometime." You nod and take the mask from Brynn. The mask still has a smile, though it has the expression of one eye winking at the viewer. For some reason, you've got a bad feeling about this. Tell Brynn where the CMC are and stash Harley at home somewhere she won't be found by our pony parents. Ideally, under our mattress or something. Maybe grab some stuff while we're there. Then, we gotta go fast back to the CMC's place and make sure we don't black out from all the running. As tempting as it is, after listening to Brynn ramble like he did it becomes easier to not put the mask on. Though you do suddenly begin to think about the good time you had with Harley on Nightmare Night. She was really friendly and you don't think she'd trick Brynn into anything truly dangerous….right? You and Brynn head back to the CMC after you stash the mask in your saddlebag. As Brynn begins his reintegration you feign surprise that you don't have certain things for a sleepover. "Well, yeah, we only just talked about it," Apple Bloom says, giving you a weird look, "You feelin' alright, Cobalt?" "Yeah, yeah I'm fine. Just gotta run home and get stuff. Where are we going to meet up at?" "Just drop on by the club house as soon as you're ready. I'll be getting it set up when you get there, most likely, but come right on in!" The group nods in unison, then goes their separate ways to get ready for tonight. Once you're out of sight from the rest of the group you run, hard and fast, until you get home. Bad feeling or not, you gotta get packed quick and put the mask somewhere your folks won't find it. A shudder runs through you as you think about one of them finding it and putting it on. Shaking your head, you stash the mask under your bed mattress. It's the only place you know they can't just stumble across it. You look back inside. Back at your room. Leave the mask! It is an artifact of the devil! We need to set an example for Brynn that it's temptation can be resisted. I am with Cosmo! CAVE TO TEMPTATION! Despite a sudden urge to go back, you step outside and securely shut the door behind you. There'll be time to solve this mess later. For now, there's a sleepover with three cute fillies and Brynn to have. You pause at the thought, before you inadvertently blush. Jeeze, when did you start thinking of fillies like that…. Ignoring the burning in your cheeks you set off for the clubhouse and a night of fun. Oh god, Brynn, I know that feel all too well. It must be even worse with hooves. Okay, things will be a mite less eventful. Or moreso? We'll see how this pans out. A reminder at this time that the talkback thread in the /qt/ section can be used to ask questions about known background info, if you find any of that interesting or whatnot. As a heads up this session is likely only going to go on another couple hours/until I feel like my writing is getting sloppier than normal. May result in cliffhanger to be picked back up either over the weekend or next weekend. You arrive at the clubhouse not long before dusk, the sun setting against the backdrop of the fall themed Sweet Apple Acres. Some noise comes from inside the clubhouse, and you prod the door open cautiously to look inside. You're halfway turned around to wait until their finished when a familiar voice calls out from inside. "Hey there, Cobalt! Come on in!" You open the door further as Applejack herself wanders from a different corner of the room that you didn't see at first glance, all smiles and happy to see you. "Didn't expect you so early! Apple Bloom thought you'd all be a while yet." She looks over the top of you by getting up on the edge of her hooves, "Oh, are the others not with you?" "Well, that's just fine anyway. Here, lemme introduce you to my brother!" She guides you to the big red stallion with a yoke around his neck, who turns around carefully, trying not to mess up the table he's been working on. "Cobalt, meet Big Mac. Big Mac, this here is Cobalt." He nods in your direction with what you assume passes for a smile, and you do the same in return. "He don't talk much, usually," she says to you, "He's simple and sweet with his words. Anywho; The two of us were just helping Apple Bloom set up, we won't be here the whole night or anything. Though if you need us for anything, we'll be right over in the farm house, alright?" You nod with a smile as Apple Bloom cheers, "Alright, I think we're done! Mostly. Just gotta wait on the others now!" It doesn't take long for the others to filter in one at a time, Scootaloo showing up in a matter of minutes, commenting on your speed, then Sweetie, and eventually, Brynn. Each have a sleeping bag and their saddlebags with stuff they need for the night or things for games, in Sweetie's case. "Looks like the gang's all here!" Applejack says from the doorway, her and Big Mac having moved toward it to help keep the room from being too crowded, "Now, you all have some fun tonight, and don't worry about being loud. We'll be in the farm house if you need us, though I think you've got enough snacks to feed the entire Guard. Let's get started then, shall we? With that, the two adults leave you, the kids, to your fun. Which of course, has yet to be determined. "So, what're we gonna play first?" Scootaloo asks while Brynn starts in on the apple slices in the snack bar. "Well, I brought a board game, and some cards, and….that's pretty much it, besides my jammies." "There's pin the tail on the pony, I've got checkers, or we can play some games that don't require materials. Like truth or dare. That kind of stuff." "I've got no preference," Brynn says as he comes back from the snack bar, bits of chips stuck to his cheek and earning a laugh from everyone before he wipes it off. "What do you want to do, Cobalt?" Scootaloo asks. In all seriousness, Brynn doesn't know the CMC that well, and they don't know HIM very well either. Truth or Dare might be a fun way to break the ice for everybody. "Is truth or dare okay?" "That's normally something they do later at parties like this, right? Maybe we should wait?" Brynn says with only a hint of nervousness. "Doesn't matter to me," Scootaloo says with a shrug. "I don't mind either," Sweetie replies. "I kind of agree with Brynn," Apple Bloom says slowly, "But…I'll leave it up to you all. >Let's play Truth or Dare! Brynn sounds nervous. Change tack; a logical colt like him would enjoy some checkers, get him to come out of his shell a little. "Okay, how about some checkers first?" "I've only got the one board, so that means that three of us are going to be sitting out while two play. Guess the three waiting can do something else while they wait, whether that's another game or just talking. Is that okay?" Brynn nods, "I…wouldn't mind that. I like checkers." Sweetie nods as well, "Me too!" Scootaloo yawns, "No thanks, that game will put me to sleep." "I'll wait my turn, then." Apple Bloom says, "So, Sweetie and Brynn can play first, then the rest of us can do something else." Everyone nods, Sweetie and Brynn move off to the side and start setting up pieces after Apple Bloom retrieves them from the back of the room. Scootaloo moves to her roll of stuff and lays across her rolled up sleeping bag so she can watch. Kind of. Apple Bloom sits next to her and they motion for you to join them. I might be too nice, but I say sit between them. sit next to applebloom, if she's looking for our attention enough to pull scoot aside and give her the whats what, it'd be a superior spot. Plus opens up quieter conversation. Have VN's taught you nothing? Neutrality is always bad end! Sit by Scoots, don't want her to get bored and fall asleep early. That would spoil the whole sleepover. Well, I DID come into this hoping for Twist ending. You decide to sit next to Scoots, giving her a friendly tap as you sit down. More to keep her awake than anything. Or at least that's what you tell yourself. Apple Bloom can still hear you if you want to talk over the top of the prone Scootaloo. "Yeah, sorry," Scootaloo says as soon as you sit down beside her, "I just can't play checkers. It's sooooooooooo boooooooring," she puts her face down into her sleeping bag, "Imf raferp-"
She puts her head up again, "I'd rather play chutes and Pegasi." Are your wings always this frazzled looking? Theirs feathers sticking out everywhere! Well why don't we play that? She sighs, "We don't have that one. I lost my set of it a while back. Don't remember where either." "I still think you left it at school that one time we had a board game day," Apple Bloom says, entering the conversation, "I bet it's at school somewhere." "Either way," Scootaloo says, turning back to you, "We don't have it." She tries to turn around and look at her small wings, but lethargy gets the better of her and she just plops back onto her sleeping bag. "Well, if they are, it's because I used my scooter to get here. That happens, sometimes. When I, uh, do tricks. Or keep my wings out too long while I'm riding." what kind of did we bring? You like card games don't you Scoots? Don't you need to fix them so the quills don't get damaged or something? Wouldn't that just slow you down? Oh, wait, do you use your wings as brakes? That's pretty cool! "Yes-No….Kind of. Sometimes I flex my wings when….when I get excited about stuff, okay? But yeah, they work as breaks. Sometimes." "Yeah they get pretty uncomfortable when they're messed up too, but they don't feel messed up so that's why I asked. They feel fine right now." Yeah I guess that sounds fine. I mostly just wanna sit around and talk. Gee, thanks, this math homework had me stumped. The three of you bust out the cards and start playing, talking as much as you care to the whole while. "So, Cobalt," Scootaloo starts as she pulls a card from the pile, "What do you think is the most fun? Sports, reading, writing, or music?" Apple Bloom gets a card from Scootaloo as she waits for your answer. "I do enjoy a good book." "Didn't he say that on the first day he was in class, Scootaloo?" You tell her to Go fish again and she gives you a funny look. "I've got my eye on you…"
"Hey Cobalt," Apple Bloom starts, "You said you liked horror books if I remember right. Got any scary stories you can tell?" The story of the haunted mask? Thinking fast, you reply, "There's one about a haunted mask, but I think it might be too scary…"
"Well now I'm real interested," Scootaloo says, scooting closer to you. The action prompts Apple Bloom to move closer to you as well. Guys, we invited Brynn to this sleepover TO DISTRACT HIM from the mask! Think fast, we've got to come up with something else! Besides, it's not even that scary, for real. Not yet, anyway. I dun goofed, didn't I? c-can we tell it quietly, so we don't "scare sweetie"? I don't think that's a good idea either, but I don't know any stories. Maybe one about a pony with a skeleton inside him? And good thing too, with all this dead air. J ust make small talk, I guess. Ask about ecent cutie mmark attempts, AB about the farm and scoots about what she's been up to lately. We can pice, k topics more once we're talking. Recover by making a deal, say they need to tell you a story first, maybe about recent CMC cutie mark attempts? "On second thought, maybe it's better if I don't tell that one," you say, earning groans from Scootaloo and Apple Bloom. "Aw, come on. We can handle it." Me too, we're at a point where I think I should call it, but it's not at a good cut off point yet. I like them telling a story first. Maybe they'll forget that we were going to tell one about a mask and we can change it up. "How about you tell me a story first? 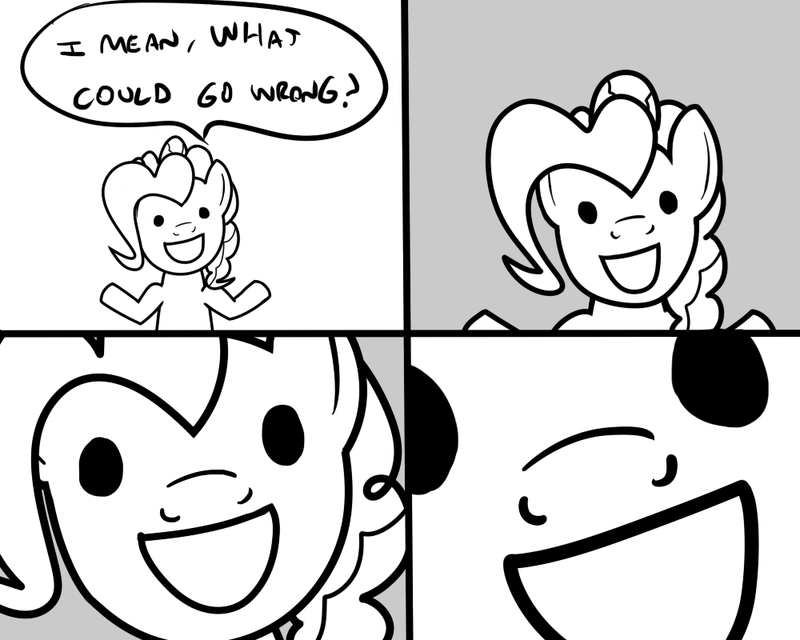 Like, what your latest cutie mark attempt was like or something." The two look at each other, then shrug. "Alright," Apple Bloom replies, the two of them turning to you with smiles, "So, last week we were trying to get our salesman and/or assistant cutie marks. Again. We were helping the ice cream vendor in the park on his last run of the season…"
The game pretty much comes to a halt as the story progresses, Scootaloo and Apple Bloom taking turns telling the story and waving their hooves around. "So, this stallion ordered, like, 15 scoops of ice cream for his office, so we offered to help carry them for him since not everyone he was buying them for was with him." "But we only had two carrier packs left, so, we started trying to balance them and stuff." "You should've seen it! Apple Bloom had something like 4 ice cream cones balanced on her head! It was great!" "…Until they fell on my head and got all in my mane…"
Scootaloo rubs her arm where Apple Bloom slugged her one for laughing so hard, but she's smiling too and you can't help but share in their laughter. At the same time, Apple Bloom gets the last card she needs from you and goes out, thereby winning the card game. "Yeah!" she says, throwing her hooves in the air and wiggling them around excitedly, "Winner!" The three of you laugh until Brynn comes over, reporting that his and Sweetie's game is over. "It was a lot of fun! Sweetie is really good at checkers, and she's pretty fun to talk to…" He falls silent for a moment, "Sorry, that, uh….I mean…"
"That's great!" Apple Bloom says with a smile, "So, we gonna keep playing checkers and cards, or are we going to move onto something else." "I think we should do truth or dare," Scootaloo says, "We can tell more stories and stuff later when it's closer to sleep time, but I've got some questions I'm itching to ask." To be continued next time. Cute quest part deux when? Thanks Aspirant, was really fun. Let's go for next weekend. Friday night seems good. I've got requests I'm backed up on still that I should work on tomorrow, plus new episode and the show discussion will happen all day. And Sunday I've gotta be on schedule for stuff the next morning. So yeah, next Friday sounds good to me. 7-8pm Central okay I hope. yeah Friday makes a lot of sense with the new episodes. definitely the best time. Thanks for another fun night of questan, Aspirant!